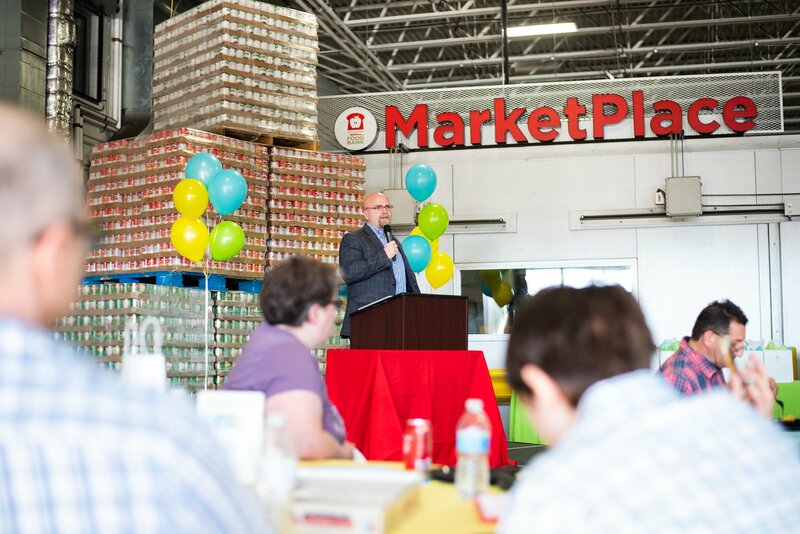 The Akron-Canton Regional Foodbank welcomed more than 150 of its closest friends to its annual Volunteer Celebration on April 9, 2019. The event recognizes the dedication and support of the Foodbank’s extensive volunteer force and is held during National Volunteer Month. In 2018, the Foodbank hosted nearly 11,000 volunteers who donated more than 66,000 hours of service, the equivalent of 31 full-time employees. New to this year’s program was the awarding of the Riley P. Counahan Memorial Scholarship to Olivia Litvin from Copley High School. The scholarship is in honor of Riley Counahan, a resident of Hudson, who died unexpectedly last year at age 16 and was a devoted volunteer of the Foodbank. His parents, Chris and Michelle Counahan, worked closely with the Foodbank and local school guidance counselors to identify eligible seniors who have volunteered with the Foodbank 20 or more hours. The Counahans awarded the $3,200 scholarship at the celebration. Riley, an avid hockey player, was a student at University School, where he was a goalie for the hockey team wearing uniform number 32. The Counahan family selected the scholarship amount with a nod to Riley’s favorite number. “I am overjoyed and so grateful to receive this generous scholarship in remembrance of Riley Counahan. It will help tremendously with my college tuition at The Ohio State University,” said Litvin. The awards ceremony also recognized the Foodbank’s top volunteers for 2018, including Synchrony as the Corporate Volunteer Group of the Year award recipient. Synchrony contributed more than 440 hours of service from 160 of its staff members last year. The organization helped sort and repack nearly 63,000 pounds of food, helping provide more than 52,000 meals to the local community. Rick & Lavonne Neale of Norton were awarded the Volunteers of the Year award. Together, they accrued nearly 450 service hours in 2018. They have volunteered during the Foodbank’s Neighborhood Distributions, at Taste of the Pro Football Hall of Fame and baked items for a Foodbank bake sale. The awards ceremony also honored the Foodbank’s Hunger Super Heroes, students with developmental disabilities from area high schools. In 2018, they volunteered at least once a week for nine months accumulating more than 2,600 hours of service. The celebration took place in the Foodbank’s warehouse. Tow motor traffic, pallets of food, deliveries and pickups ceased to make way for life-sized Jenga and hula hoops. Barbeque was brought in from Mission BBQ, and a local cotton candy spinner offered sweet treats to guests. Volunteers brought their families, enjoyed music from a DJ and there was no need to put on gloves or wear aprons; the event was strictly a party; no work allowed! To learn more about the Foodbank’s volunteer opportunities, visit akroncantonfoodbank.org.